Notice issued by the manager of Penrhyn Quarry at the start of the 3 year strikeBangor University’s Archives and Special Collections has been successful in a grant application for assistance with the cataloguing of the remaining Penrhyn Castle papers. 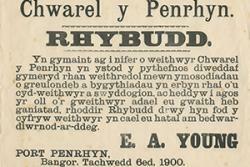 The Penrhyn collection has been in the University’s care for over 25 years. A large percentage of this collection has been catalogued over the years and some of these lists, such as papers relating to the Bethesda Quarry Strike 1900-1903, are available online via CALMView (http://calmview.bangor.ac.uk/CalmView/). Statistics reveal that the Penrhyn collection is already one of the most popular and most commonly consulted by the University Archives’ readers. During the academic year, 2013-2014, 1185 Penrhyn documents were consulted. Elen Simpson, Archivist, said: “Public demand for this important collection has made is a top priority for cataloguing hence our decision to apply for a grant from the National Cataloguing Grants Programme for Archives once again this year – and thankfully, this time, we were successful. "We are very pleased that we have received this funding. It is high time that this important collection is fully catalogued, and the hope is that anyone with an interest in Pennant family history can have access to all documents in the collection very soon." 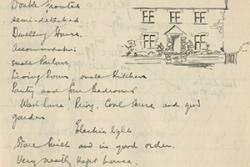 Image taken from a survey book of the Penrhyn estate dating from the 1920’s.The project will involve the employment of a full-time “Project Archivist” for 20 months to catalogue the remaining collection. The successful candidate will work closely with the archive staff and volunteers to ensure that every single document is listed, numbered, packaged and boxed according to archival standards. This work will be of importance to historians far and wide. The Penrhyn collection has enormous significance to the cultural heritage of Gwynedd, but the “Sugar and slate: The Penrhyn Castle Further Additional Papers” project will highlight its importance on a wider scale. Einion Thomas, University Archivist, said: “The completion of a multi-level catalogue of an unbroken estate collection dating from the 12th century to the present day will provide vast scope for research. It is the mission of the Archives and Special Collections to be at the heart of academic research within the University. 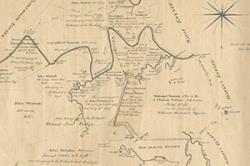 Map of plantation lands in Jamaica owned by the Pennant family in the 18th centuryThe completion of the catalogue will open up access to the previously uncatalogued material, and what has been a largely untapped research resource. This will be a key factor in supporting both teaching and research developments within the University and further afield.